I can hardly believe it’s the 2nd month of the year already . It’s been nothing but work for me , well .. not entirely , there has been some fun in the mix. I have done quite a few out of town trips in recent months . Some of which I promise I will share here. February is one of my favorite months in Jamaica. 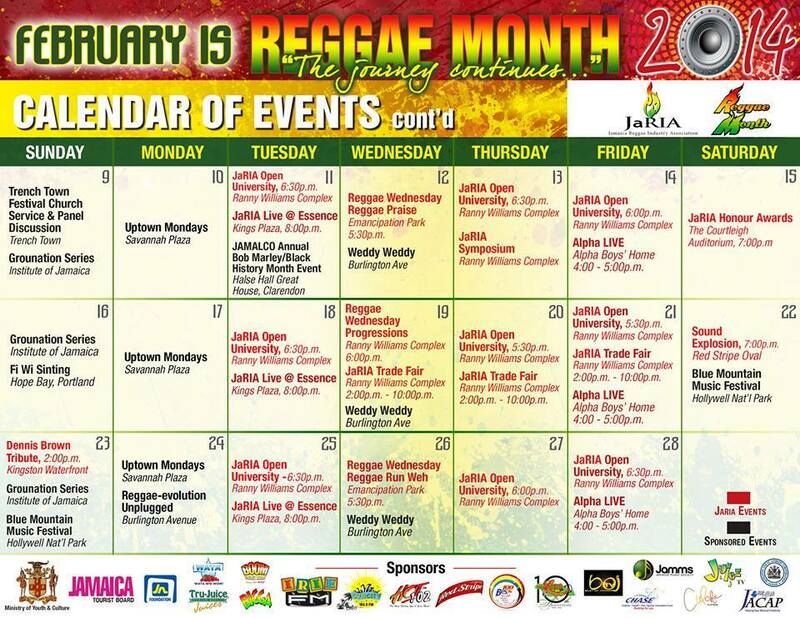 I know I probably say this a lot because there is something special about every month but February is Reggae Month which means tons of free or really cheap concerts with world class standards in Jamaica. It’s amazing to be able to see International Recording Artistes in small intimate settings , I’m a huge music lover and it’s one of my favorite things about Jamaica. Live music events is not as popular as it should be or as would be expected in a country credited as the birthplace of Reggae but when there are events , it is the real deal. Although totally unplanned , I started off Reggae Month at Wickie Wackie, in Bull Bay, St. Andrew. Wickie Wackie is actually a beach and in recent years the home of monthly live music events. If you want to see the future of Reggae Music, some of the best bands in the Caribbean , young up and coming talents in a relaxed atmosphere then this is the place to be. Julian Marley, Raging Fyah, Pentateuch were the big names of the night . Listening to roots rock reggae with the sound of the ocean in the back drop is a pretty sweet life and even sweeter is the entry fee of JA$500 (less than US$5). The night was all about good vibes as is generally the case at this event. 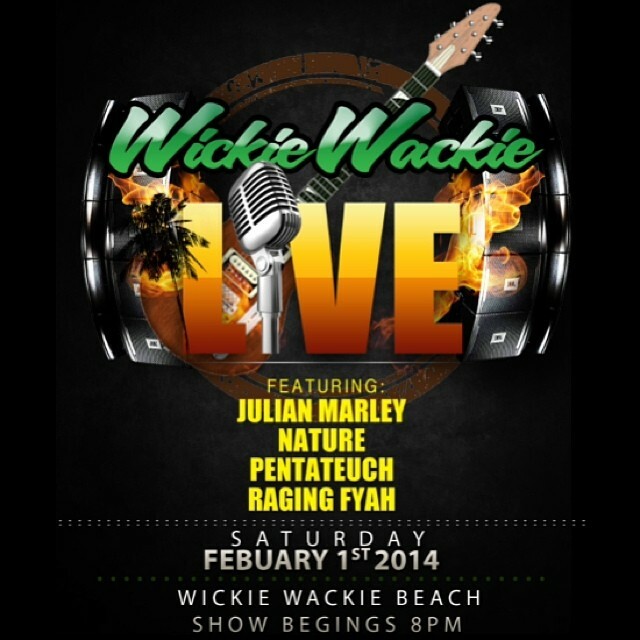 The next Wickie Wackie Live will be on March 1 so if you plan to be in Jamaica around that time , it is totally worth seeing. You can drop me a message on the blog and I will be happy to update you with any news of the event. You may have missed that but the good thing is that this is only the beginning of the month long festivities. February 6 is the birthday of Reggae Superstar Bob Marley and some of the month’s activities will pay tribute to him. There will be small events around the island but Kingston is always at the heart of the celebration and although it is not the popular choice of tourists , Reggae month is one great reason to give the city a try especially if you are a lover and supporter of Jamaican music. Every Wednesday , Jamaica Reggae Industry Association (JARIA) will host FREE concert series at the Emancipation Park in New Kingston as well as other events. 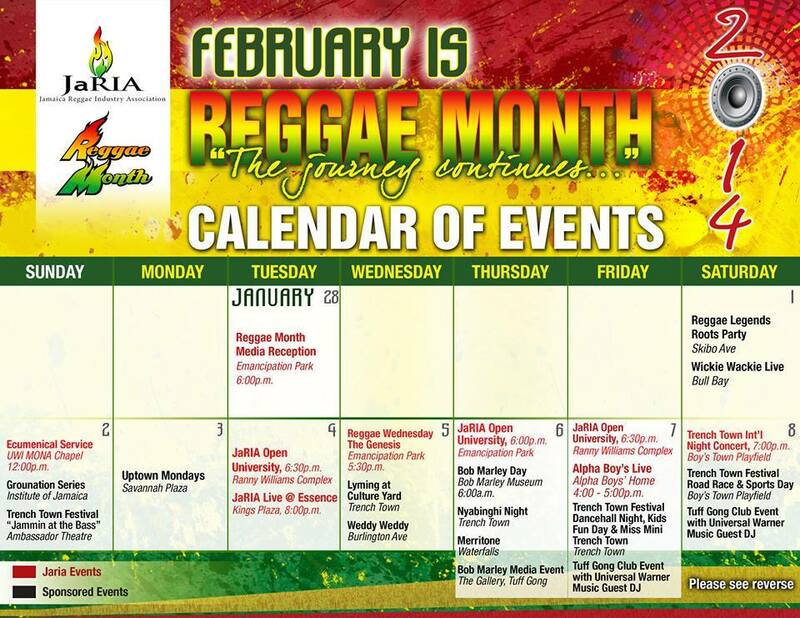 Here is a Calendar of the planned activities for this year’s Reggae Month but in true Jamaica fashion I am sure other’s will pop up across the island. Please go out and support as many events as you can. For more info you can check out JARIA’s website or facebook page . Happy Reggae Month , Happy Black History Month and Happy February. Feel free to reach out on the blog re any questions you may have or general Jamaica travel questions . You can also hit me up The DryLand Tourist of Facebook or follow me on twitter. waht about trenchtown and bob marley cake day at hope road. are there events and u miss denis brown earthday bash.. looking for more shows to go to. Previous Previous post: Shaggy & Friends 2014 : A Party for a Worthy Cause.